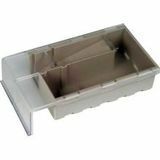 Humane Live Catch Multi Mouse Trap - Small is a no kill, no poison, effective trap for catching and trapping house or garden mice alive. These live catch mouse traps are pre-baited with a palatable mouse bait food and are ready for use to humanely control and get rid of a mouse infestation or mice problem. This easy to set humane mouse or mice trap will catch, but not kill, up to 4 mice at a time and has a clear view top panel for easy identification of a mice catch.